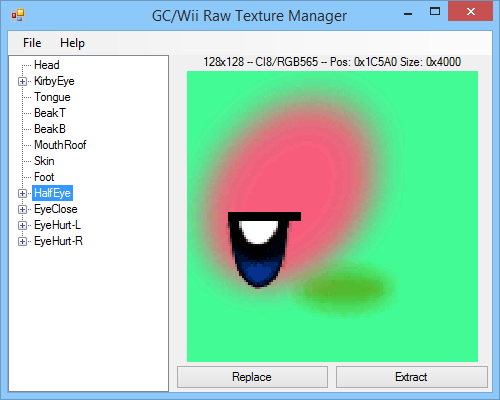 Raw Texture Manager is designed to help you extract and replace the textures inside Super Smash Bros. Melee's uncompressed data files. It doesn't analyze the files or their structure in any way; rather, it tries to match the filename of the .dat file you're trying to open with one or more definition files in the Definitions folder. Each definition file lists the locations, formats, and sizes of each texture in the .dat file it is describing. See the readme file (README.html) for more information.